I have been going here for about the last four years when at Canalway Cavalcade. Normally the clientele are overflowing into the road outside on Bank Holiday, but this year there were four. I waited five minutes at the bar to be served; there were only two staff serving and one was a novice; normally there are four or five staff on; not many people were inside. After still waiting to be served, to no avail, I walked out in disgust. Going through an exterior make over at the moment.... all scaffolded up. Still open and interior as I remember it. All wood paneling, big Bass mirrors and an ornate fireplace. Getting to the bar a challenge. Which is a good thing to say, as means its popular. Trumans Swift was pretty average condition on latest visit. Returning for a second time for a pub lunch went well. Had a pint of Aspall’s Harry Sparrow award-winning cider off the hand-pump – just the job. It goes well with the Warwick’s ham, egg and chips, or Lincolnshire sausages, mash, seasonal vegetables and onion gravy. 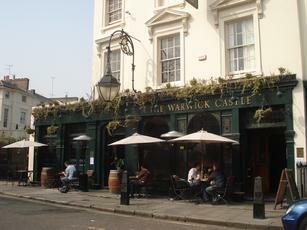 Reasonable price (for London) for pub grub and a pint. A pleasant looking bar and friendly staff. Nice and quiet. I’d visit again if I was thereabouts. Have to agree with an earlier review and say I was slightly disappointed. Looks really good and the atmosphere is ok - decent beer. It was let down by two things: the food, which was a bit too average for the price and I'm sorry, but a "Grilled Aubergine Burger" ought to be an actual burger, not just two slices of aubergine in a bap which really isn't worth £8.50 - and also the lady behind the bar who really didn't sound like she could be bothered to serve us (pulled a really bad pint of Guinness as well). A shame, because the other chap who served us was really nice and friendly. I'd be prepared to give it another go if we were just having drinks, but I wouldn't eat there again. I was slightly disappointed, given how nice the local area and exterior of the pub are. Pretty average,with bad music being played quite loudly, though the Green King IPA was very good.